dailydelicious: Light Chocolate Brownies: Everyone will love it! 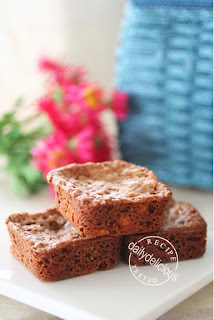 Light Chocolate Brownies: Everyone will love it! Whenever thinking about brownies, most of the people always have their own version. Actually many people think that the brownies had to be tense, and will be welcome by the chocolate lovers. But as I told you that, I have many family members who don't like bitter chocolate, so I have to find the best solution for everyone (include me, haha). 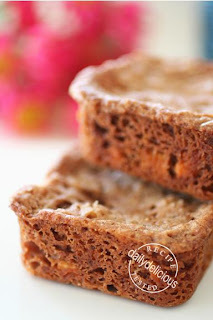 This recipe came from .............. one of my old cookbooks collection. There are many books in these series (well, I had many books from..................., I bought them when I started collecting cookbook ^ ^). 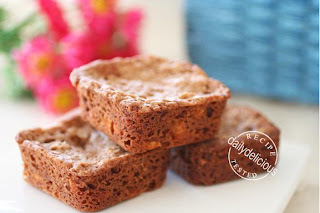 The original recipe came with a chocolate frosting, but I think it's not necessary, and without frosting this brownie is very easy for traveling too. These brownies are not too chocolately, so I think it will be easy to enjoy by everyone (even they are the chocoholic or not, haha). *I'm using Dessert Bar Pan, so I got 12 pieces. Preheat the oven to warm 170°C (325°F/Gas 3). Put the chocolate in a bowl. Half fill a saucepan with water and bring to the boil. Remove from the heat and place the bowl over the pan, making sure it is not touching the water. Leave the chocolate to melt slowly, then remove the bowl from the pan. Grease a shallow 20 cm (8 inch) square baking tin, and sprinkle with flour or line the base with baking paper. 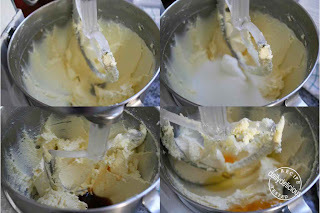 Cream the butter, vanilla extract or essence and sugar together in a large bowl with a wooden spoon or electric beaters, until the mixture is light and fluffy. Gradually add the eggs to the creamed butter. Stir in the melted chocolate. 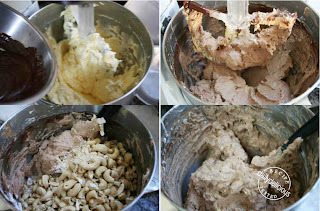 Sift together the flour, salt and baking powder into a bowl, and add the chopped walnuts. Add to the chocolate and butter mixture, and stir until just combined. Pour into the tin and bake for about 45 minutes, or until firm and springy to the touch of a finger. Cool in the tin. 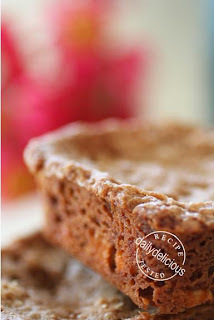 *I'm using Dessert Bar Pan, and the baking time will be 25-30 minutes. Coffee and Parmesan Yule Log: Surprised Flavor!